Fewer young people are looking to work the paddies, threatening Indonesia’s dream of rice self-sufficiency. In the rice paddies of Cigugur, tucked in the shadow of West Java’s Mount Ciremai, farmers tend their crops; stalk is cut, bundled, then whipped against rocks of adequate size; grain, once released, is piled on tarp, raked, and dried. Along a terrace packed dense with soil you are struck by the abundance of mature and weathered faces performing each task. Men and women, tan from years in the fields, work with antiquated technology similar to that used during Suharto’s New Order. The stigma held then, of dirty work and little reward, has carried into the new era with damaging effect, creating an unpredictable human infrastructure that may prove detrimental to future Indonesian rice production and Indonesia’s path toward rice self-sufficiency. “The young generation is less interested in agriculture; [they] think about soiled clothes with no pride as opposed to office-looking clothes,” says Hilmi, a graduate student and millennial from Cigugur. Hilmi and his friends were raised to view the paddies as a place of last resort, sentiments supported by those working the fields. On May 15, Indonesia’s Ministry of Trade announced plans to import 500,000 tons of high-grade rice from Vietnam and Thailand. The announcement came as a surprise to many in that it contradicted previous assertions made by Ministry of Agriculture officials regarding sufficient levels of rice production by Indonesian farmers. The change in tone marked the second time in five months Indonesia’s State Logistics Agency (Bulog) was dispatched to import large quantities of rice to combat the possibility of consumer prices rising above ceilings set in 2017. The price ceilings of $0.71 per kg for medium-grade rice are nearly double that of the world average at $0.40 per kg. Having produced 74.2 million tons of unmilled rice in 2017 alone, Indonesia currently sits as the third largest rice-producing nation in the world behind China and India – countries of quadruple its population. Unfortunately these numbers seldom satisfy a country wherein rice is consumed at rates near 150 kilograms per capita per year. As the government seeks to maintain a respectable public cache of rice reserves, it is not uncommon for Bulog to import the commodity several times a year, often to ensure its availability for urban middle-class residents. While reserves have seen a recent rise – totals of combined public and private reserves increased from 2 million tons in 2003-04 to a target of 10 million tons in 2015 – imports continue as safeguards against natural disasters and price instability. While the president is optimistic, touting increasingly positive rates of production, the rate at which rice is produced may not prove most vital over time; rather it is the farmer population that may be of greater concern. Indonesian paddy labor is steadily aging out of the fields. Despite nearly half of Indonesia’s working population finding employment in the agricultural sector, various studies claim that between 60 percent and 80 percent of rice farmers are above the age of 45. In a span of 10 years, from 2003 to 2013, Indonesia’s Central Bureau of Statistics noted a distinct rise in the proportion of older people working the fields, a proportion that will surely surge in the years to come. Constant production is necessary to feed a growing population reliant on white rice as its staple food, though what farmers say suggests human infrastructure will continue its downward trend as education takes priority and is seen as a path out of working the paddies. The government’s current efforts to achieve rice self-sufficiency focus on reducing rice consumption while increasing production through the modernization of, and investment in, physical paddy infrastructure (i.e. paddy irrigation canals, dams), technique and farmer support. Reducing rice consumption as a means of achieving self-sufficiency is admirable yet striking in its similarity to failures proposed by Sukarno during the early years of Indonesia’s independence. Taking steps to stymie rice imports throughout the mid-1960s, following years of importing at some of the highest rates in the world, Sukarno’s government was unable to match reduced reliance on external aid with sufficient in-country production. Sukarno’s inability to maintain necessary levels of rice production led to campaigns urging Indonesians to forgo rice in favor of cassava or corn, starches viewed as lower class foods. The campaign proved ineffective as Indonesians refused to alter their dietary intake and felt degraded by their own government. Times became desperate. Rising prices and frequent food shortages resulted from this lack of balance between state rice production and the imports increasingly relied upon to feed the nation. Today’s production initiatives reflect those taken during Suharto’s New Order; Indonesia’s most recent period of prolonged rice self-sufficiency, lasting from 1984 until the 1998 Asian financial crisis. Having replaced the Sukarno regime in 1967, Suharto sought to modernize Indonesian paddies while utilizing the modernized techniques of a blossoming Green Revolution. Like Suharto, Jokowi’s administration has placed great emphasis on the expansion and repair of paddy irrigation canals. Per The Jakarta Post, in 2017 the Indonesian government opened 80,000 hectares of paddy, along with 500 water deposits, to curtail the nearly 110,000 hectares of land lost yearly through residential construction. Additional efforts from the Ministry of Agriculture include farmer insurance in times of unforeseen weather problems, Bulog’s purchase of local grain at prices higher than that of the international average, and various programs to educate farmers on modern techniques and technology. Together these plans may well lead to future rice self-sufficiency. But all these programs may prove to be in vain, if Indonesia cannot count on a new generation of farmers to replace the generations whose members are now in the fields. Under Suharto Indonesian rice production flourished under the programs in place; however the threat of an aging population of farmers was of little concern compared to the situation today. The government is trying to address this problem through empowerment programs for youth interested in agriculture. 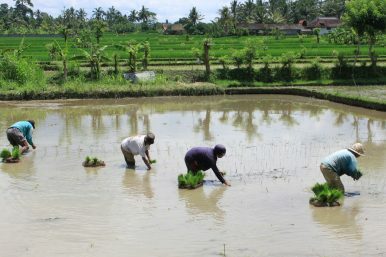 According to the Ministry of Agriculture’s Kuningan district office, entrepreneurship and paddy management training is essential in teaching the various sides of rice production and its multifaceted nature. These programs, along with the establishment of farmer groups geared toward women, rely on the creation of SMEs (Small and Medium Sized Enterprises) or SMEs with existing Sustainable Food Houses. The ultimate goal is to form a collaborative effort with relevant agencies such as the Department of SME, Trade, BPMD, or the Department of Manpower, in conjunction with private companies, to generate youth interest from several angles. These points of youth empowerment, it must be noted, are seldom included in any official plans from the Ministry of Agriculture to accomplish rice self-sufficiency. Partnerships with relevant agencies have not yet gained much traction in terms of youth outreach. As an agrarian nation seeking to curb imports of its country’s staple food, Indonesia must establish concrete initiatives centered on the three general areas of emphasis cited above. A national campaign to educate students in all schools about the changes being made to Indonesian rice farming, and its increasingly modernized technology, is a good start. At the moment most agricultural education is restricted to those attending SMKs (vocational high schools), rarely reaching students on a university track. Providing government incentives to students who join agricultural youth groups or women’s groups will increase exposure and give more reason to work in the paddy. Economically supporting these students through a subsidized university education, reliant upon them agreeing to work in rice production following graduation, can help eradicate the stigma that continued education should not lead to jobs in agriculture. The Jokowi administration is doing a good job supporting farmers and the conditions in which they work. To make sure immediate production success lasts in the long term the Indonesian government must provide a link between the nation’s school systems and its agricultural sector so as to steady the increasingly unpredictable future of rice paddy labor. Gavin McGovern is an English teacher and Teacher Trainer with the U.S. Peace Corps. He serves in the Kuningan Regency of West Java, Indonesia. McGovern received his B.A. in Political Science and Economics from Bucknell University. The views and opinions expressed in this article do not reflect those of the U.S. government or those of the Peace Corps.